Q: Did you ever make real maps? A: Denis makes maps, and had some – from his work in progress on the Boylan Heights neighborhood in Raleigh NC – featured on NPR’s This American Life. A few of his maps are linked there but they ain’t great scans. I will get some better ones and post them here sometime soon. As for me, Making Maps has over 300 maps in it and I made most of them; they sorta count. Below find a few maps I made in the olden days – with scribers, stick-up type, pens and ink, all finished off with photomechanical processes in the dark room. 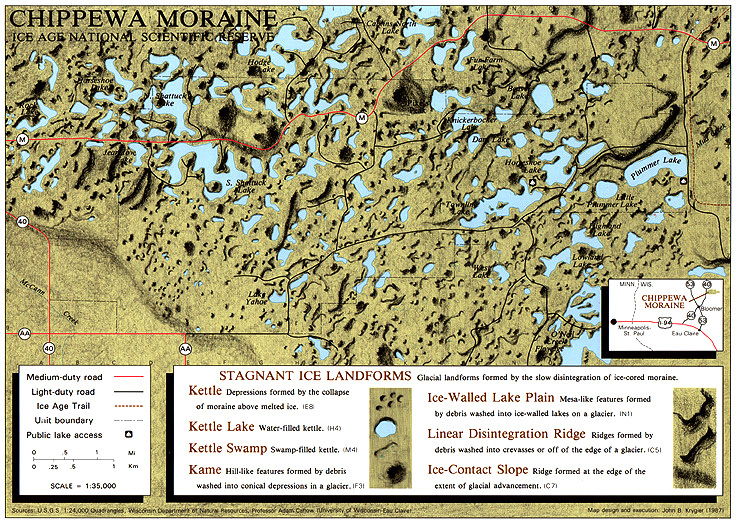 I was the last generation to learn and work with traditional (non digital) map production (late 1980s) and the first to learn and work with computer graphic design software that could make maps as well as the old traditional techniques (Illustrator and Freehand on a Mac). David knew how to do shaded relief by hand, with graphite, and showed me how. The glacial terrain on the map was easier than “normal” terrain and the result was not bad (for a beginner). The rest of the map was scribed & used stick-up type. My mom’s family (the Wolf’s) live near the area shown on the map. 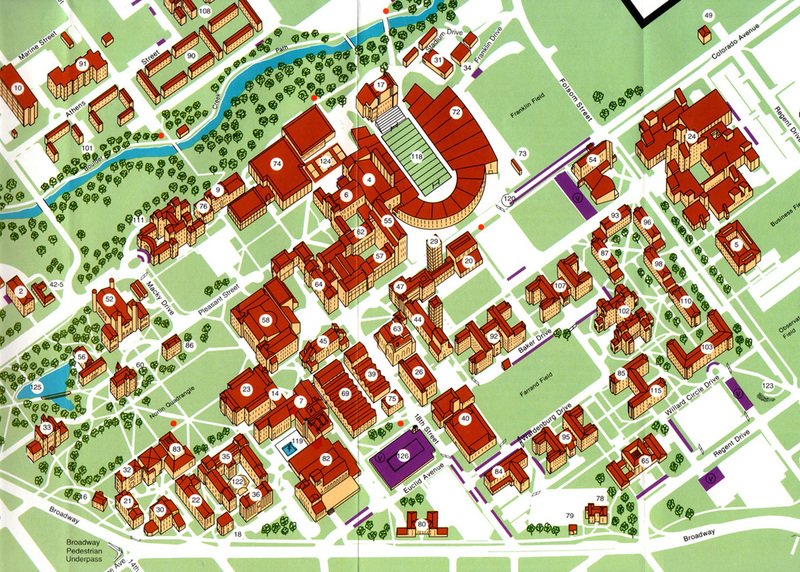 The map won an Honorable Mention in the 1987 R.R. Donnelly and Sons Map Design Competition (see below for the map that won the competition that year). David DiBiase started this project when he acquired detailed flight information about the Voyager flight – the first airplane to fly around the world without refueling. When the publisher of the book about the flight heard we had the data, they asked us to create the map for the book endpapers (thus the gap in the middle of the map: the left half was the front endpaper, the right half the back endpaper). The map was published in the hard cover version of J. Yeager and D. Rutan Voyager (New York: Knopf). The map won the 1987 R.R. Donnelly and Sons Map Design Competition. I had to scan the map in several pieces and there is some distortion where I photoshopped the pieces together. The map was – amazingly I think – done with technical pens and ink. I traveled to Boulder to sketch and photograph each building on campus. Back in the lab, I had to develop a generalized sketch of each building – not too detailed but detailed enough to distinguish the building. Each sketch was then inked on mylar and cleaned up with an x-acto knife. I created the building windows by scanning the inked buildings into Adobe Illustrator (probably version 1.0! ), creating the windows (not the buildings) then printed the windows really big, then reduced the printout in the darkroom, burned it on the same film we used for type stickup, and stuck them up. I also drew all the trees by hand (pen & ink again). This map was a tremendous amount of work. I doubt the map is used anymore, and here is a clickable WWW version that, at least in part, replaced it. Looking at the WWW map suggests to me that technology is providing us with more diverse media for mapping, but that the design of maps in these new media is often mediocre at best.